Crimps the Bullet in place more firmly than any tool! Factory ammunition is often more accurate and better able to withstand rough handling because the bullet is firmly crimped in place. A firm crimp improves accuracy because pressure must build to a higher level before the bullet begins to move. This higher start pressure insures a more uniform pressure curve and less velocity variation. Even powder selection is less critical. Until now, handloaders seated the bullet to touch the rifling to achieve similar results. This is not always possible nor desirable. 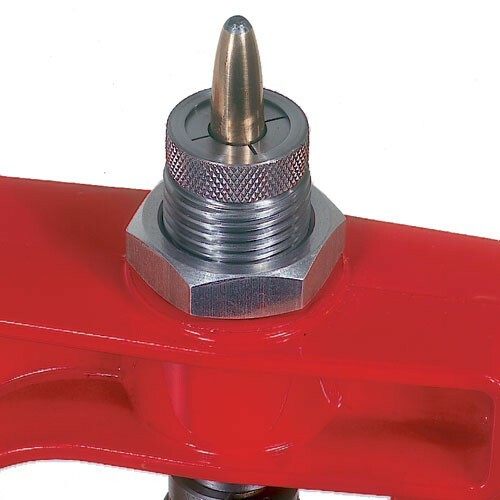 The Lee Factory Crimp Die is included at no extra charge with Lee PaceSetter Dies. It's just another added value that only Lee Dies offer.